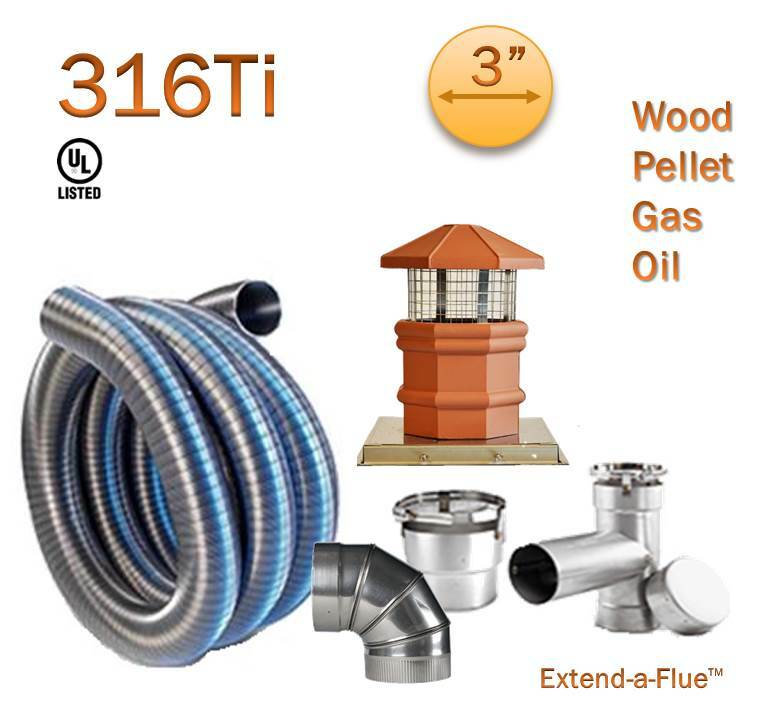 316Ti Simple Flex Chimney Liner Kit - 3"
The Simple Flex 316Ti liners are recommended when venting wood, pellet, oil, or gas burning appliances. The 316Ti Simple Flex Chimney Liner Kit is backed by our Lifetime warranty. Follow the simple maintenance requirements and this chimney liner will be the last one you install. Using our chimney liners will increase the value of your home as the warranty will transfer to the next occupant. Simple Flex features the unique Fast and Easy connection system. The Fast and Easy connection system makes your install job run quickly and smoothly. Each connection in the liner system can be made by simply tightening one screw. This screw pulls a strong connecting band tight around the liner for a strong and tight joint. Unlike many other liner systems, the Simple Flex Liner is so simple to use and install that one man can get the job done. Experience peace of mind, with the knowledge that your chimney is lined by a fully UL tested and listed liner system. The Simple Flex liner is listed under the UL 1777 standard by the Underwriters Laboratories. This liner features a seven ply seam with ten corrugations between each reinforced seam. It is both air and water tight and offers superior flexibility. The included Proper Topper and top plate assembly not only look good, they protect your chimney and liner system the elements. They stop water from entering into your home and help ensure the longevity of the liner system. Our top plate will hold your Chimney liner system in place even in the strongest of storms. UL Certification: UL 1777 standard by the Underwriters Laboratories. Designed and tested to withstand 2100 degree chimney fire and still maintain the warranty.